Wow! Has it really been three months since my last post? Where has the time gone? Wedding and baby season definitely keeps me super busy every year. With that season finally coming to a close, now I can focus more on keeping my blog updated with cool new techniques and beautiful crafts. Today I wanted to show you a simple Thanksgiving card I made using Peerless watercolors. 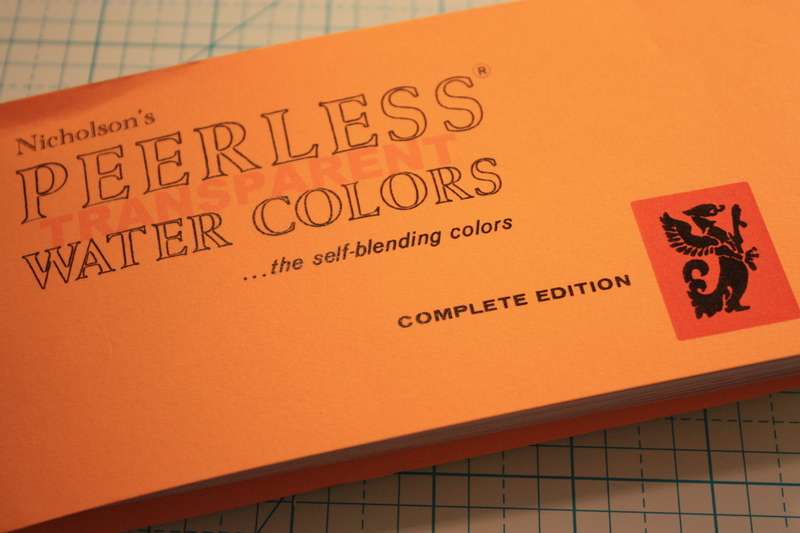 This is the Peerless Watercolor booklet. The “Complete Edition” is a misnomer, there are more than 40 other colors available! If you have never used these water colors before, I highly recommend trying them. They are super easy to use, come in bright colors, and very inexpensive. (I got this booklet at my local paper crafting store for around $15.) As a bonus, they blend absolutely flawlessly, so they are perfect for no fuss painting. The colors come in sheets or in liquid form. 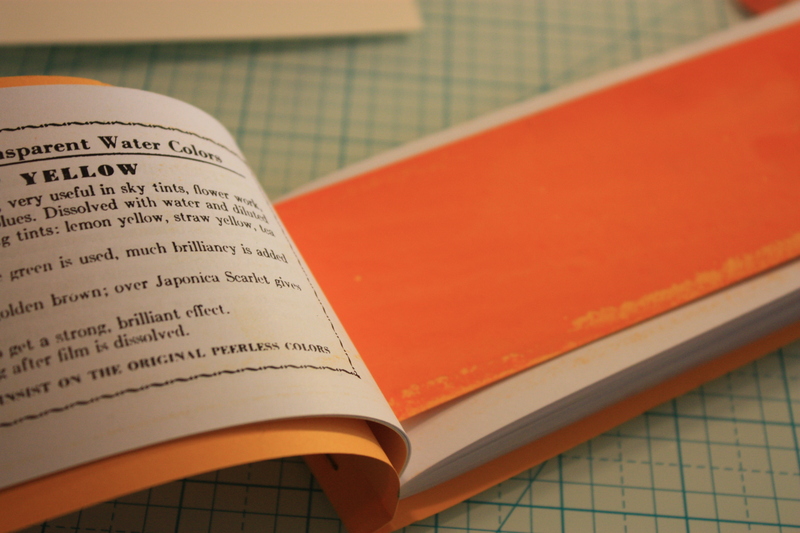 Each sheet of pigment has a corresponding page with the color name and some ideas on how to use the color and what other colors to mix it with. Refills for the booklets are available. There are many ways to use the Peerless watercolors, but I like to just snip off a small piece of each of the colors that I would like to use. 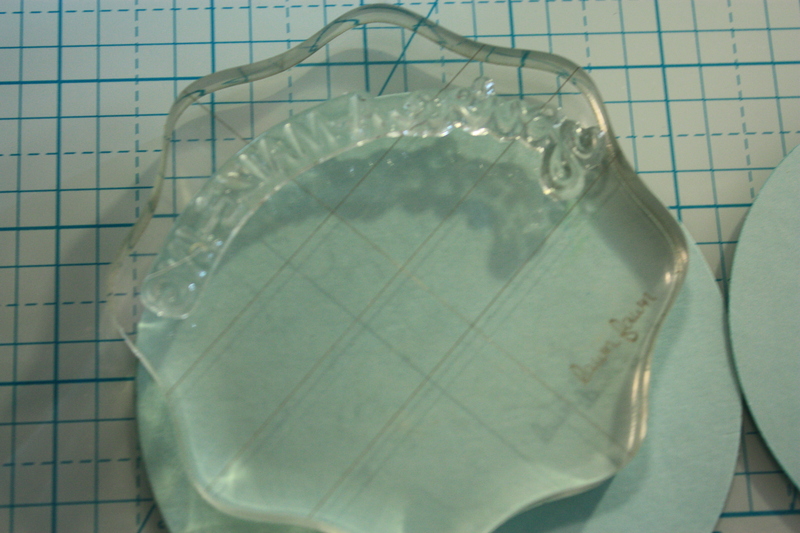 You can put each little section in a small dish, but I just line them up on my glass cutting mat. Next I touch a wet brush to the square to pick up some of the color and simply paint! Picking up the color doesn’t take much water, and it goes very far. 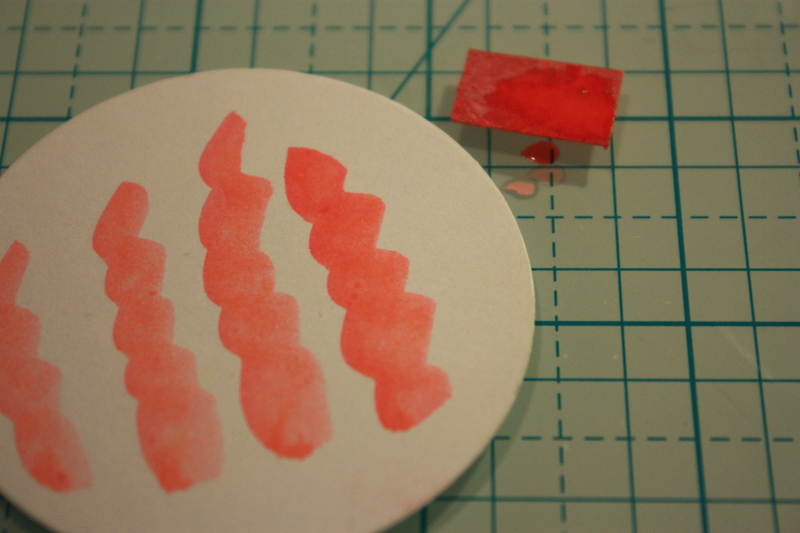 You can keep using the small squares pigment for quite awhile before all the color is exhausted. You can use clear or white for this technique. For this card I wanted to do a no line watercolor, but I do not have a very steady hand, so I decided to fake it with some clear embossing powder. 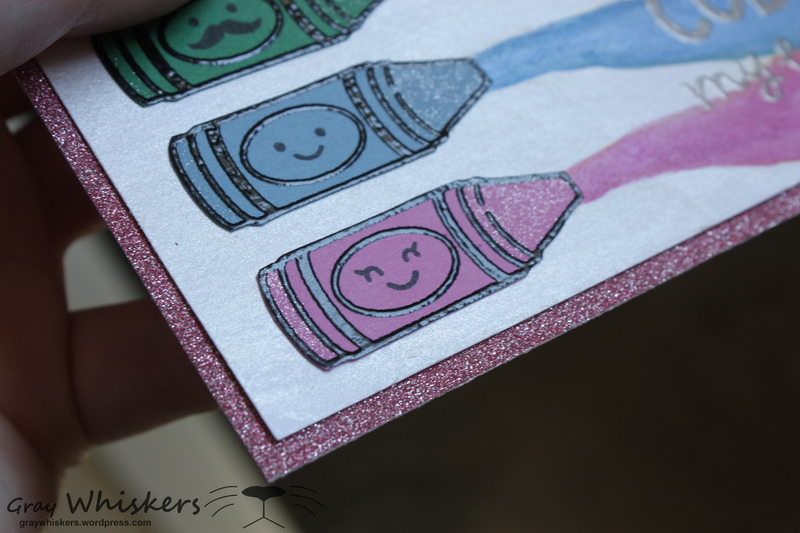 The watercolor will resist all of the areas that have been embossed, so it’s okay if you go outside the lines! First, I embossed the Scarecrow from Lawn Fawn’s “Happy Harvest” in clear embossing powder. I painted it in with: brilliant yellow, flesh tint, Japonica scarlet, Mahogany brown, Sepia brown, and sky blue from the Peerless Complete Edition. I used the Peerless Metallic in Copper for his buttons. Next, I stamped the corn stalk from the stamp set and embossed it with yellow embossing powder. I colored the background with distress inks (Victorian velvet, squeezed lemonade, and fossilized amber). I wanted my sentiment to follow the curve of the cut circle I was using so I laid my acrylic block over it and simply curved the sentiment as I mounted it to the block. 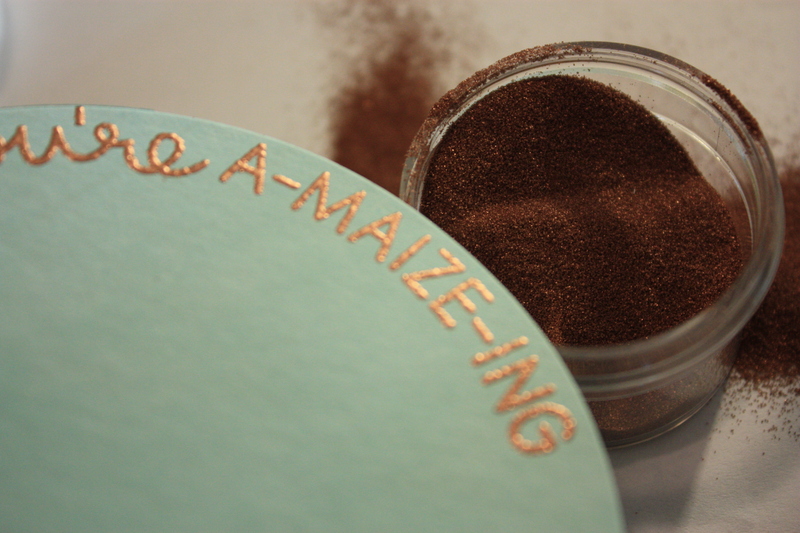 I embossed the sentiment in Metallic Copper embossing powder to match the copper in the scarecrow’s buttons. Look at how beautiful and shiny it is after embossing as compared to before! I adhered all the pieces on some gorgeous embossed wood grain paper I got from my local paper crafting store and added a ribbon. Super easy, and very cute! For more information on Peerless Watercolors, check out their website. If you would like to try out any of the products I used on this card, check out the links below! Hello friends. Today I have a very special project to share with you. My sister is got married last month and I had the honor of designing her wedding invitations. 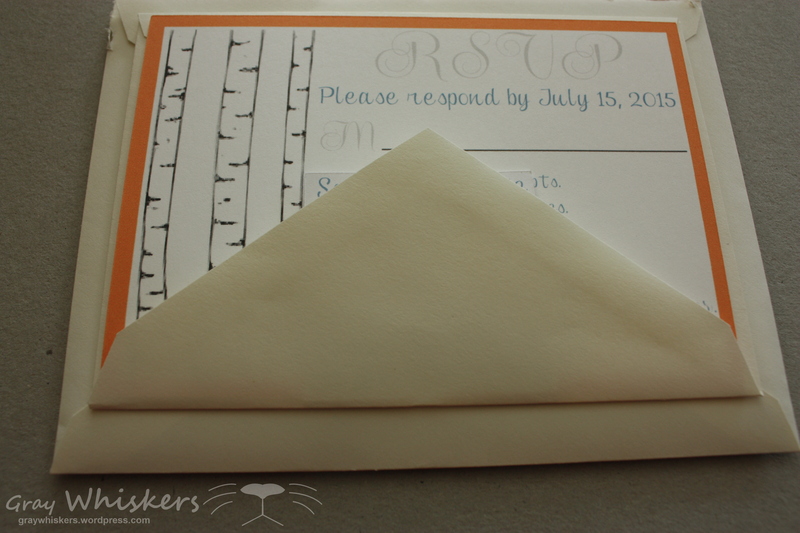 The wedding invitation suite consisted of three main parts: the invitation, the R.S.V.P. card, and the Save The Date calendar sticker. The theme for the wedding was Woodland and the colors were orange, silver, and steel blue. I have included a few links in the article below to the products I used to make these invitations, but please note that while I do receive a small compensation for items bought through the links, I never recommend products that I don’t use and love myself! I was not asked by Cricut or any of these companies to use their products or provide these links, I just think these products were perfect for this project. To save a little bit of money, we decided to make simple stickers for people to put on their calendars rather than a traditional save the date post card. I made these stickers using my Cricut Explore™ in Cricut Design Space™. I used the Print Then Cut feature to print the text then cut the circle shape of the calendar sticker. I printed these out on Cricut® Printable Sticker Paper. 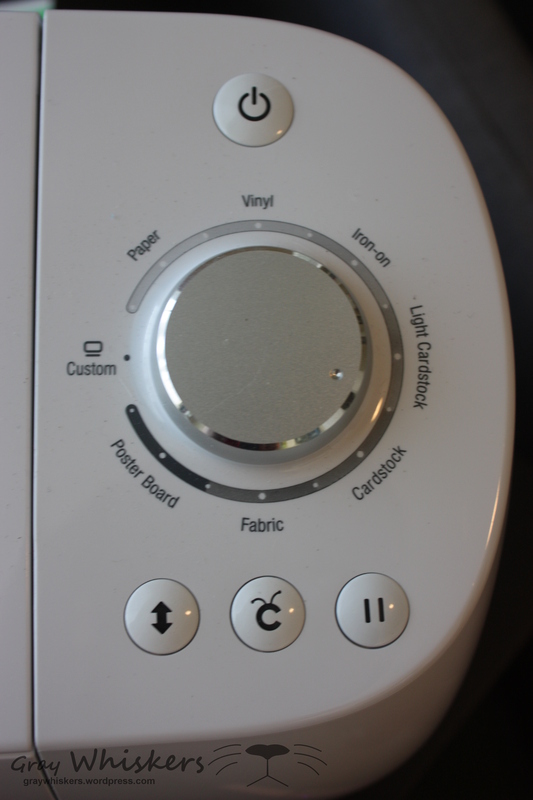 I set the dial on my Cricut Explore to “Custom” then selected the Cricut Sticker Paper from the drop down menu. The great thing about this setting is that the Cricut will only cut through the top layer of the paper and leave the backing in tact. The next element of the wedding suite was the RSVP cards. I loved making these and I think they turned out great. I again used my Cricut Explore™ and the Print Then Cut feature in Cricut Design Space™. I laid out the design I wanted and put a cut line around the outside of it. This cut down on the amount of trimming we would have to do after the printing. We used Neenah Solar White 80 lb cardstock . This may be my new favorite cardstock for Print Then Cut. It is very smooth and cuts beautifully. The invitations were by far the most labor intensive part of this suite. Thank goodness I had my sister and her fiancee here to help! 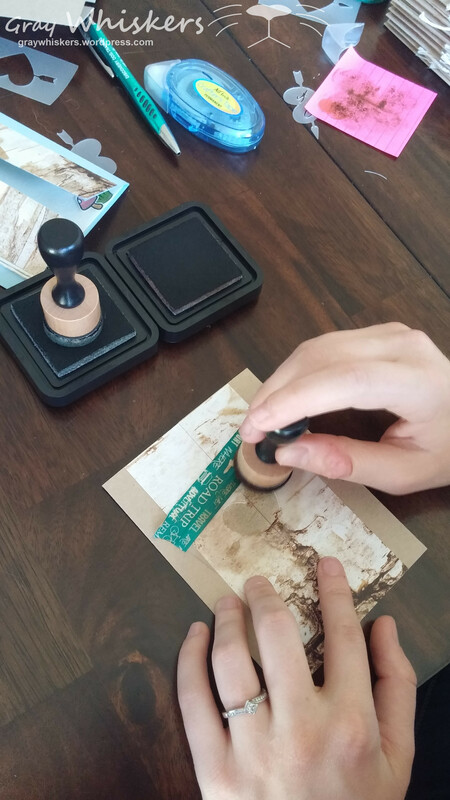 To start out we stamped the images we wanted for the inside of the invitations. (There were 1,200 images in all!) We used the Lawn Fawn stamp set “Gleeful Gardens ” and its coordinating dies . We then colored all the images with Derwent Inktense colored pencils and highlighted the white areas with Copic Opaque White. Next we die cut all the images. We held the dies in place with washi tape. As we die cut everything, we kept them separated by image so it would be easier when we got to our assembly line. 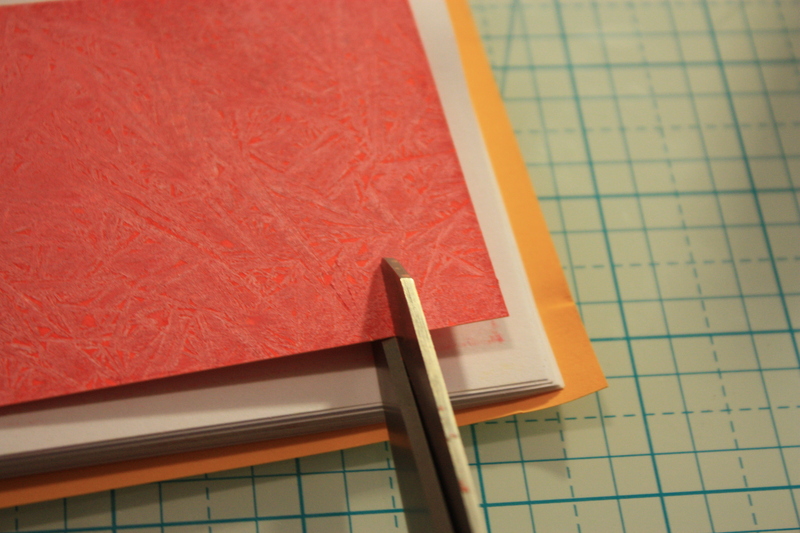 The next step was decorating the outside of the invitations. 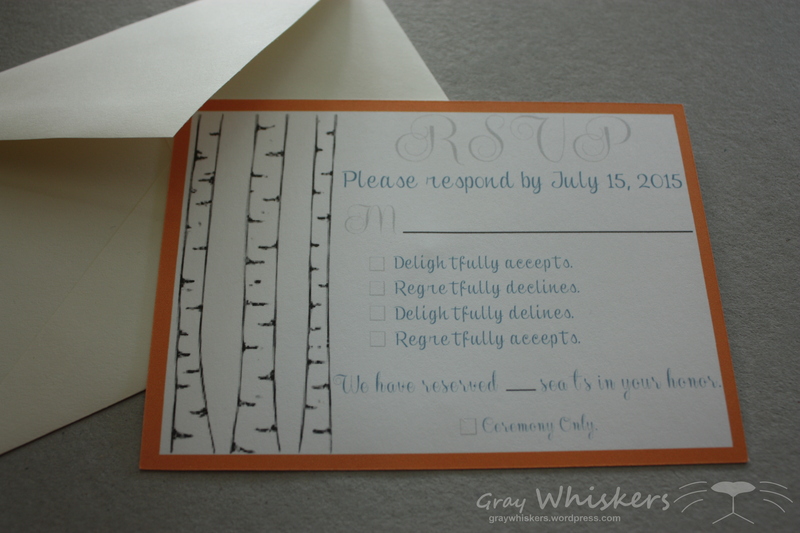 To stick with the woodland theme, we chose a beautiful birch patterned paper from Hobby Lobby and cut a few strips and adhered those to the outside of the invitation. Then, using my Cricut Explore™ I made a two part stencil from the Cricut Cuttables Adhesive Backed Stencil Material (this material is no longer available but you can find a similar item here). 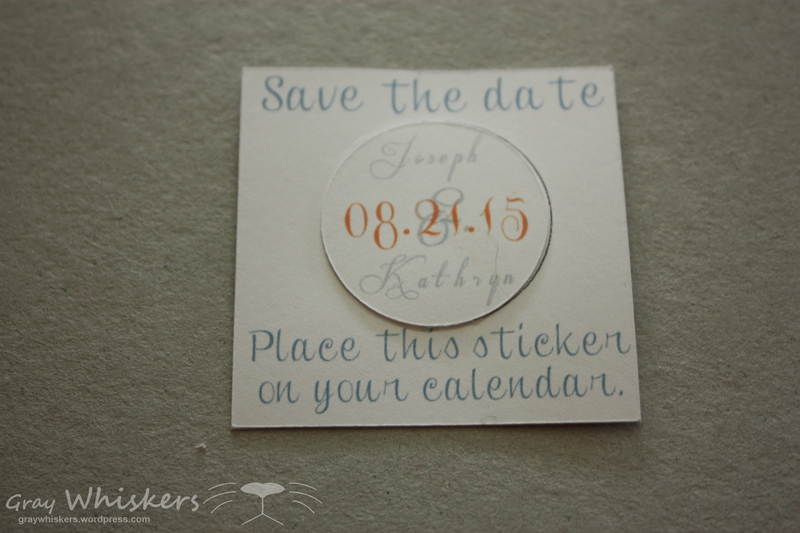 To stencil the front of the invitations, we used Distress Inks, and the Mini Blending Tool . To get started, we laid down the open heart stencil and pounced on Walnut Distress Ink. Then we placed the second stencil in place and pounced on Rusty Hinge Distress Ink using a finger dauber . We held the stencils in place with washi tape rather than using the strong adhesive on the stencil material. These inks gave a very beautiful air brushed look to the front of the cards. 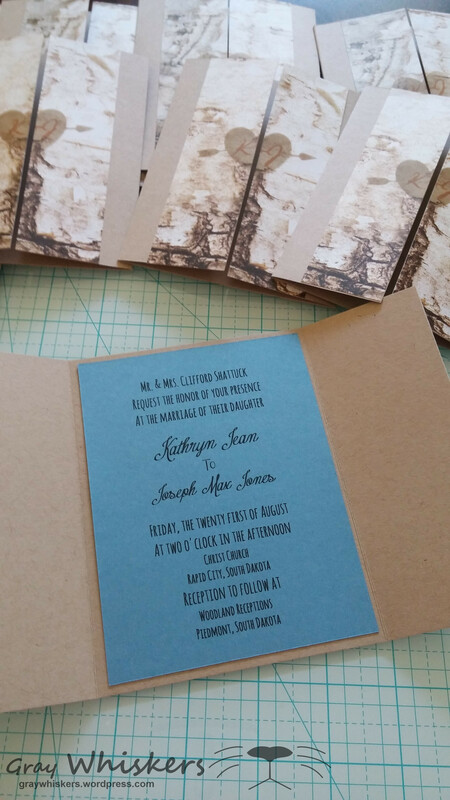 For the inside of the cards we printed the invitation wording on blue card stock and adhered it to the inside of the birch cards. 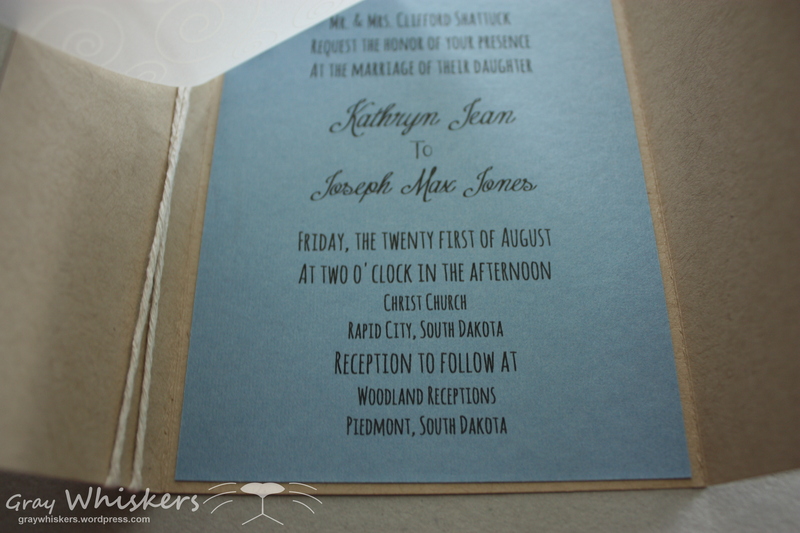 To give the invitations a touch of elegance, we added a velum overlay. So the guest could still easily read the words underneath, we attached the velum only at one corner. 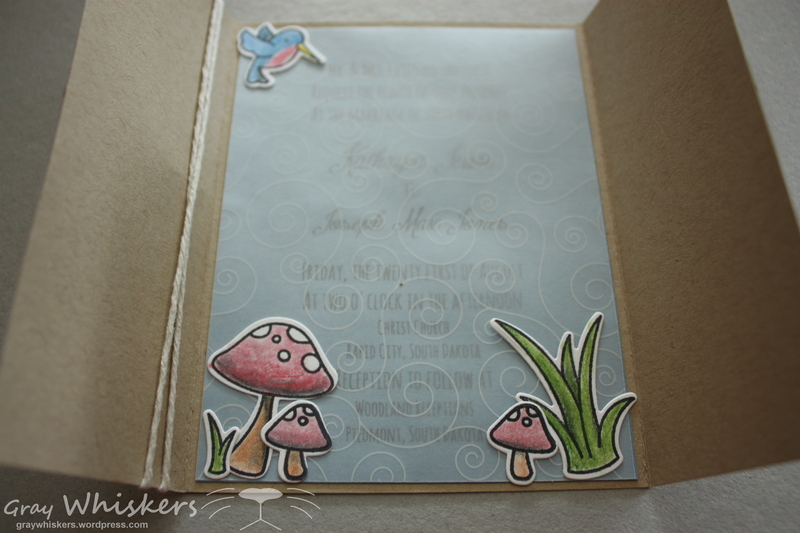 The last step of the invitations was to add all of our little hand colored creatures to the front of the velum overlay. The final step in the process was packaging everything up. 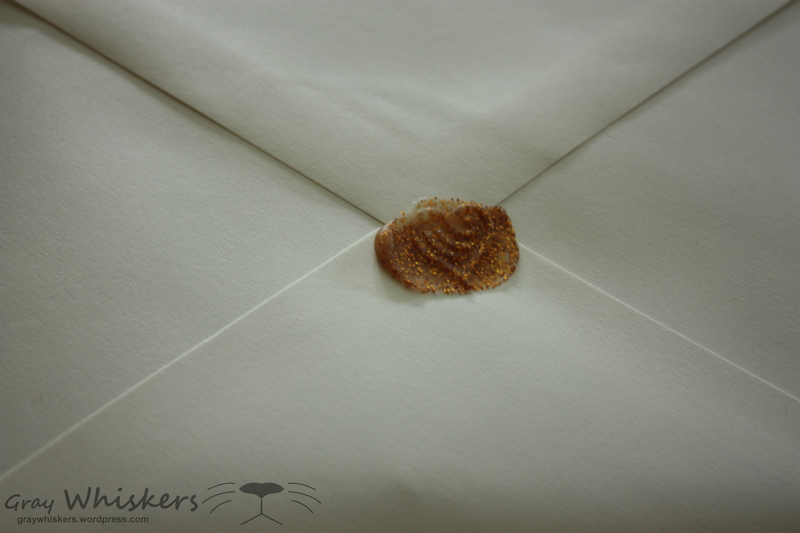 We purchased simple cream colored envelopes from our local stamping shop. 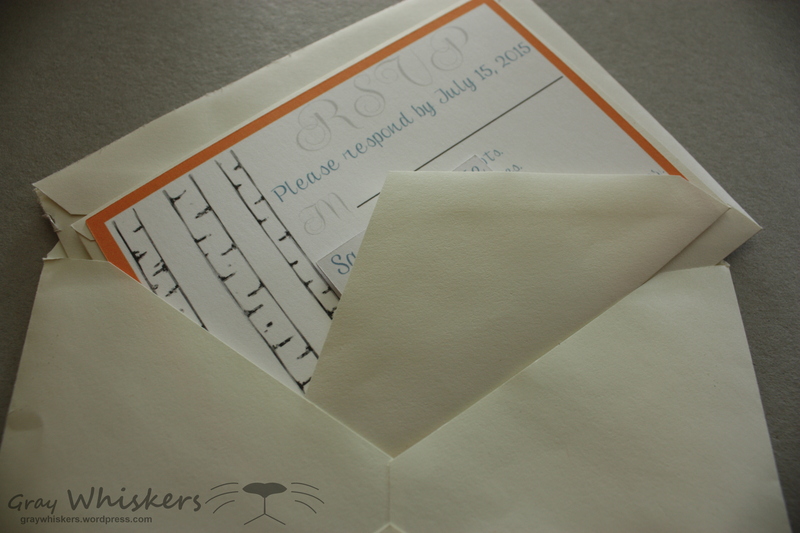 The RSVP card went into a 4-bar sized envelope with the return address on it for guests to easily mail back, and the invitation itself went into an A2 sized envelope; these along with the Save the Date sticker all got tucked into an A7 envelope. This was a super long post and thank you so much for sticking with me to the end! Thank you for stopping by and have a great day! 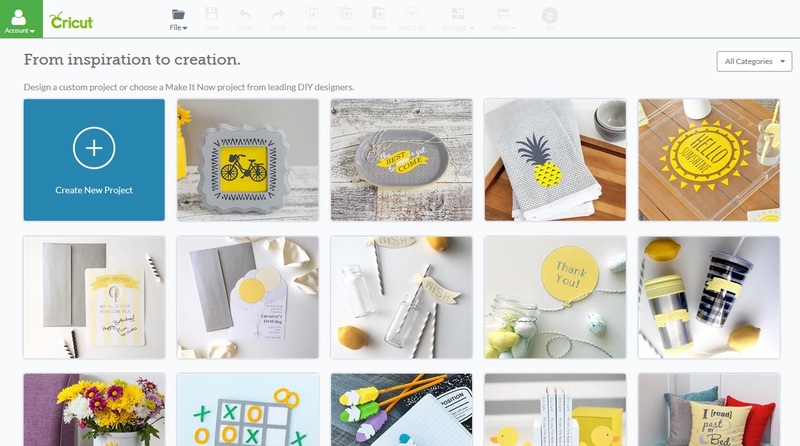 Recently Cricut launched a “Getting to know Cricut Explore” campaign to help introduce people to the new machines in the Cricut family. 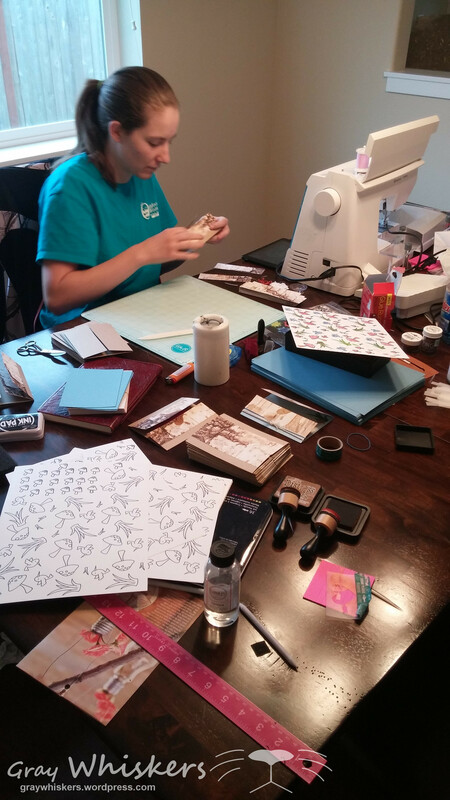 As one of Cricut’s blogging affiliates they have asked me to write a post to help introduce my readers to these machines as well. Please note, that while I do receive compensation for product bought through the links included in this post, I only recommend products I use and love myself. This post is the final post in the the four part series. If you missed the introductory post to this series, find it here; part 2 of this series, “Cricut Explore Air™ vs. Cricut Explore One™” can be found here; part 3, “Cricut Design Space 101” can be found here. Today’s post will be a wrap up of everything we talked about in the first three posts. I will review two of my favorite features and talk about a project I made with each of them. The “slice” tool in Cricut Design Space is one of my most frequently used. 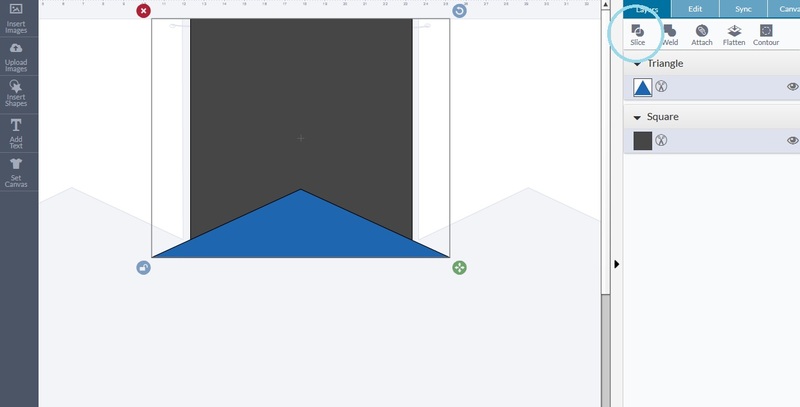 This tool allows you to use two shapes to make a completely different shape. The slice tool is easiest to picture as a virtual “cookie cutter”. 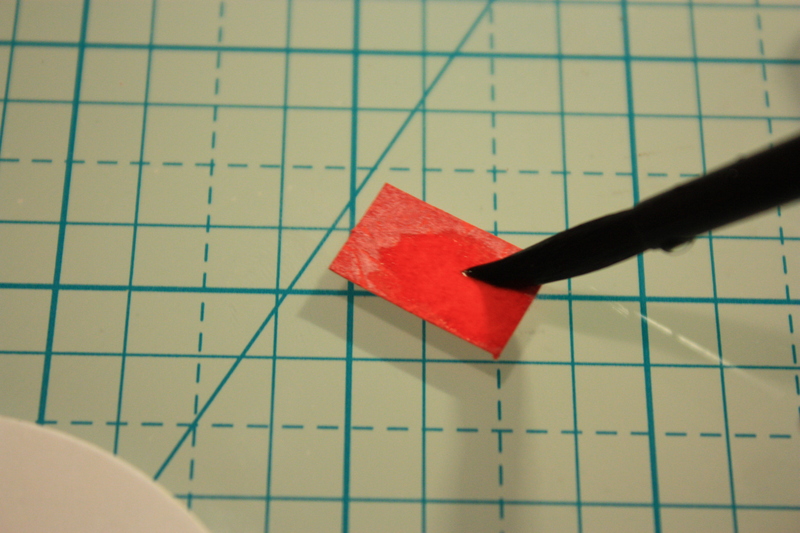 If you have one shape on top of another, it will “push” the top shape through the bottom one to cut a new shape. Rather than trying to explain it further, let’s look at an example. 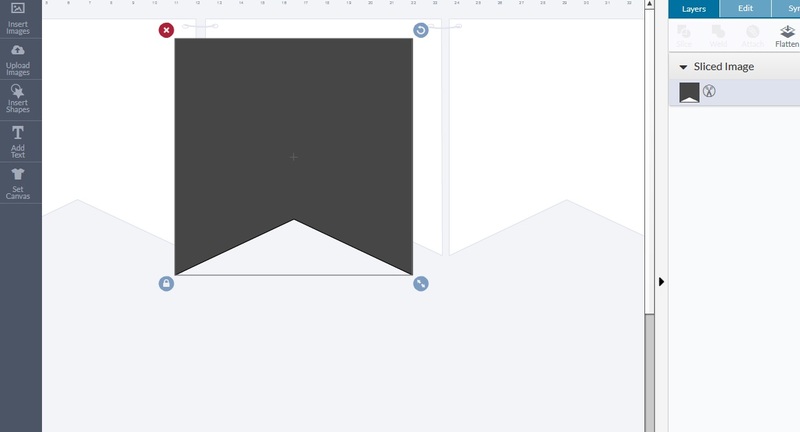 used the “Set Canvas” feature to select a fish tail banner and set the size to 11″ x 11″. This will serve as a template when I set my shapes. Next I inserted two basic shapes, a square and a triangle. I used the canvas outline as a guide to set my shapes. Now remember, the blue triangle will be “pushed” through the gray square to cut a new shape. Click slice. After you delete all the pieces you don’t need you are left with a perfect fish tail banner! The most versatile feature of Cricut Design Space is the “Print then Cut”. I use this feature frequently if I have a complex image with lots of layers that I do not want to cut out separately. Or, if I have an image in mind that I do not own. 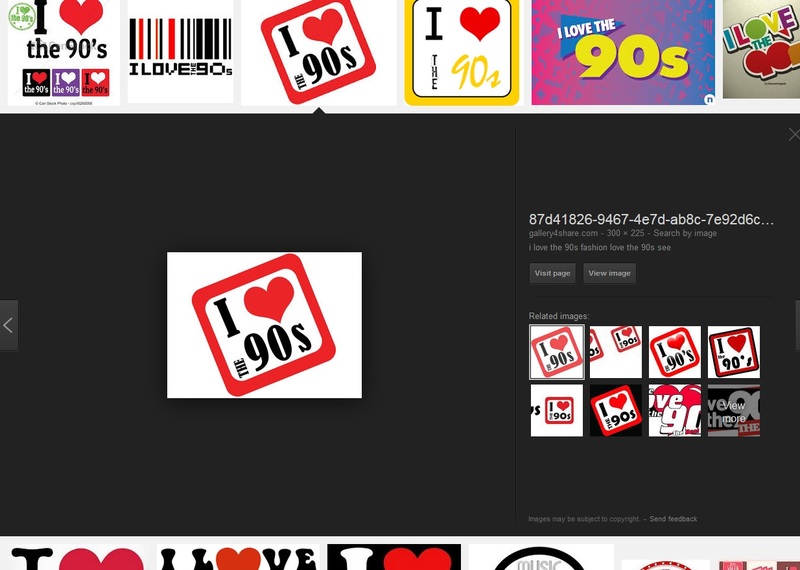 For this project I needed some amazing photo props for my friend’s 90’s throwback birthday party! I didn’t really own very many images that I wanted to use as props, so I found some images I liked on Google. Once I found an image I liked, I saved it to my computer. Next, I uploaded the saved image to my Design Space. Then I walked through the upload wizard to delete the background of the image using the “magic wand” tool. In the final step of the wizard you will see a small check box that says “preserve original image within shape”. This is telling the Cricut if you would like to cut out a silhouette, or if you would like to print all the colors and then cut. Make sure that box is checked for “Print Then Cut”. Once all the images are uploaded to your Design Space, click Go! The black registration marks around the images on each of your pages will help the Cricut calibrate and figure out where to cut. Click “Print & Go”. Your images will all be sent to your printer first, then you will be prompted to load the printed pages one at a time into your Cricut. 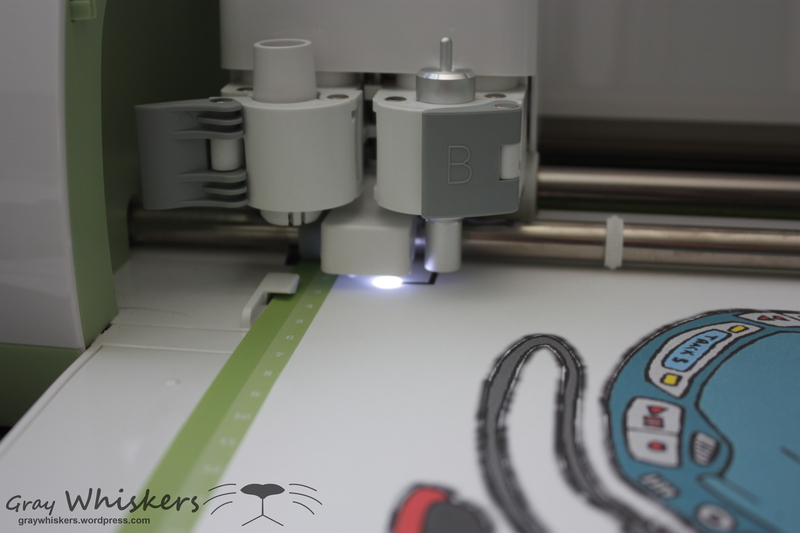 The Cricut will then locate the registration marks and cut out each of your images. 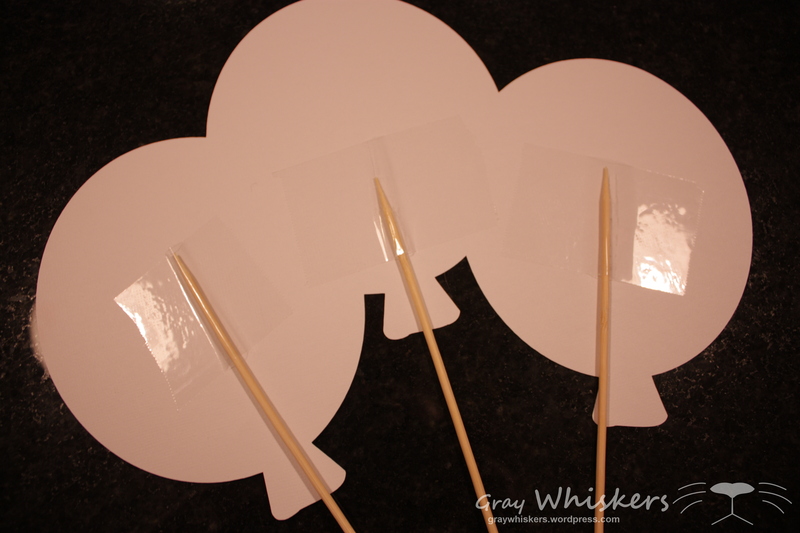 To finish up my photo props, I just taped some simple wood skewers to each one and was done! So there you have it from Google to party in just a few steps! I hope these last 4 posts have been very helpful and educational. I can’t wait to see what amazing projects you guys come up with using this helpful and really cool features. Hello friends! Today I have a super sparkly card to share with you. I made this card for the Lawnscaping Challenge: Sparkle and Shine challenge. 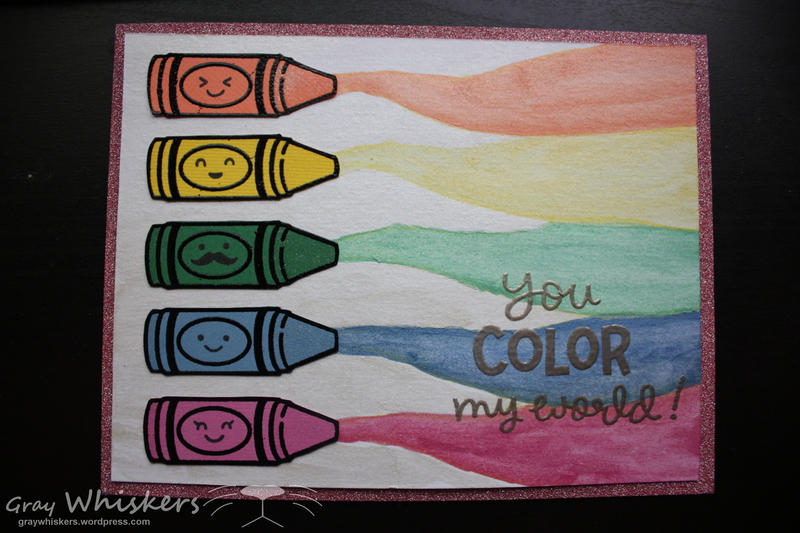 The stamp set I used is Lawn Fawn‘s “Color My World”. I have had this set for a while and had yet to use it, so this seemed like the perfect opportunity! 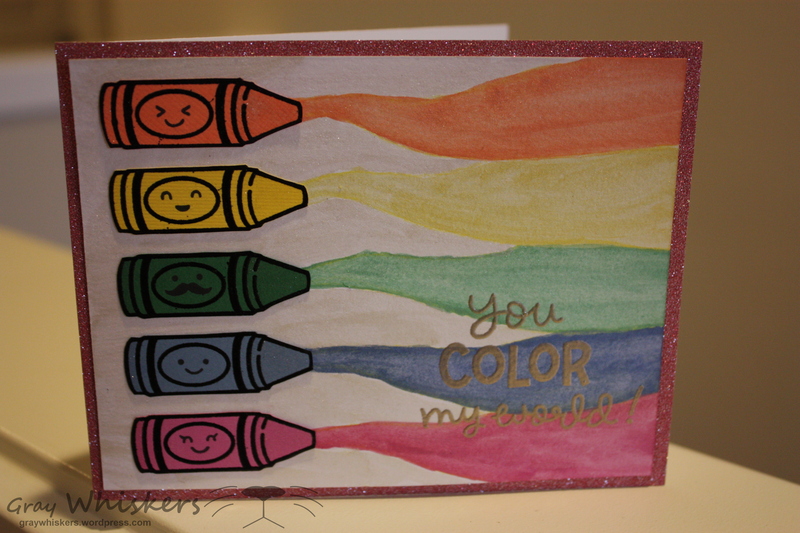 I used a scrap piece of Pow Glitter Paper for the front of my card and different colors of solid scraps for my crayons. 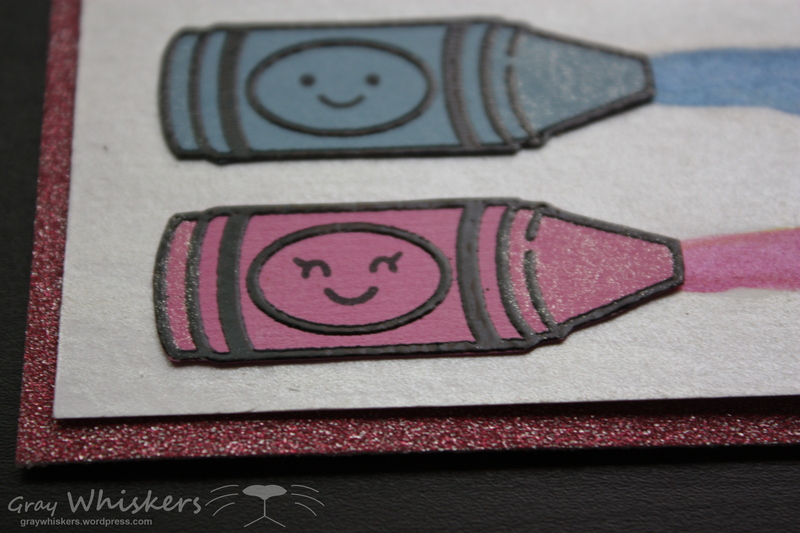 I black heat embossed the crayon image onto the scraps and fussy cut them out. I then used my yellow Derwent Inktense pencil to draw a very light outline of where I wanted my color splashes. I used an Inktense pencil here because I wanted the line to fade away when I did my watercolor painting. If I had used a regular lead pencil for the outlines, the lead would have become “trapped” under the paint and I would not have been able to erase it. I didn’t want to be stuck with gray outlines. Eek! Finally I carefully painted in the different areas with my shimmer paints. I made sure not to overlap any of the paint where the different colored areas met because I didn’t want the colors mixing. 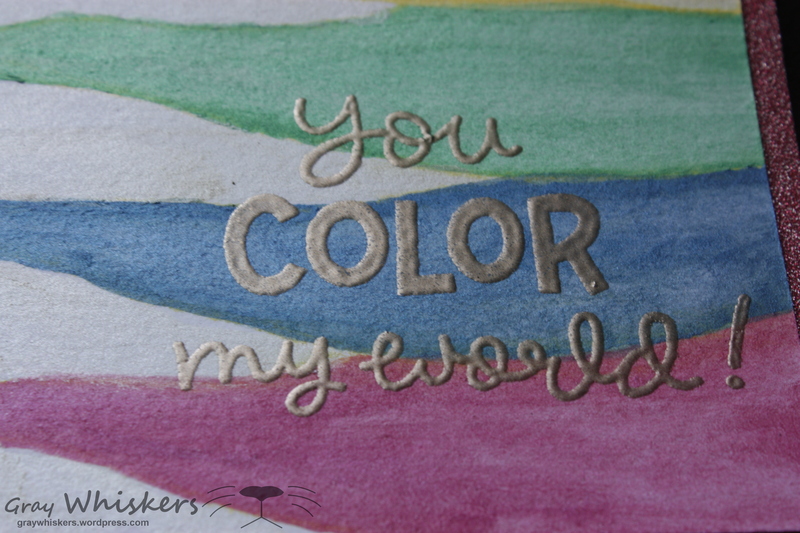 The paints I used for this card are very inexpensive shimmer paints that I bought at my local paper crafting store, Impress. You can find these paints here. For the sentiment on the card, I just used the one that came with the set and heat embossed it in Liquid Platinum embossing powder from Ranger. 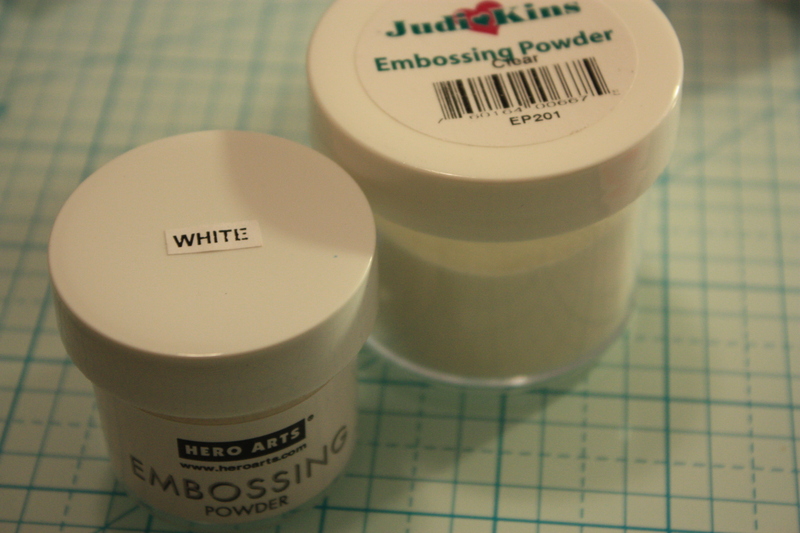 I love this embossing power, it has a beautiful sheen but isn’t too over powering since I didn’t want to loose focus from my watercolor background. 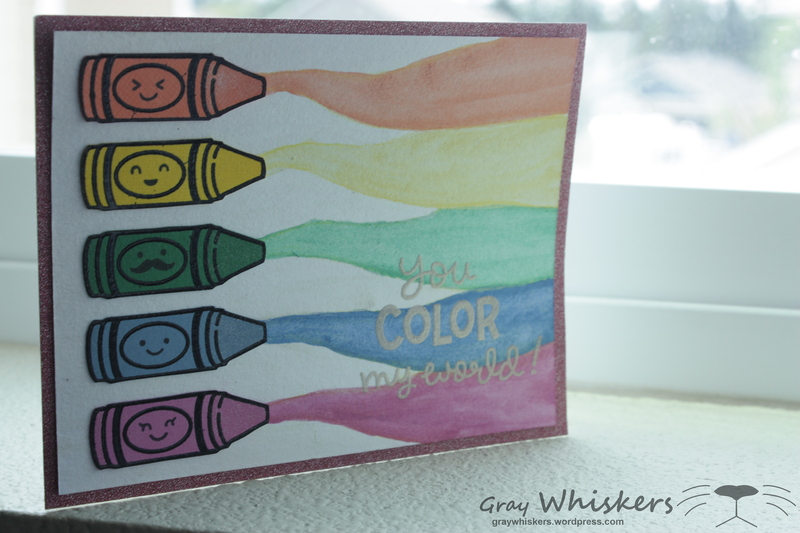 To finish the card off and to make it extra sparkly, I went over the tips and ends of the crayon images with my clear Wink of Stella brush pen. This made the images look like sparkly crayons wrapped in regular paper. Here are a few close-ups of the pretty sparkles! I love the look the Wink of Stella brush pens give without being so messy! Quick and Easy. I hope you guys liked this card and thank you so much for stopping by! This post is part 3 in a 4 part series. If you missed the introductory post to this series, find it here. Part 2 of this series, “Cricut Explore Air™ vs. Cricut Explore One™” can be found here. 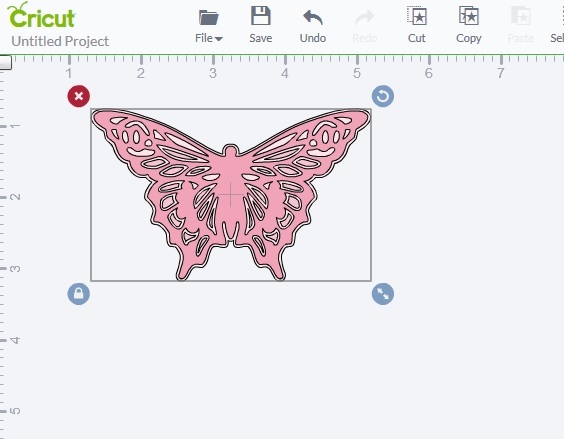 Today’s post will be a very brief introduction to the Cricut software, Cricut Design Space™. This software is free with your Cricut machine and runs through the internet on your computer or iPad. 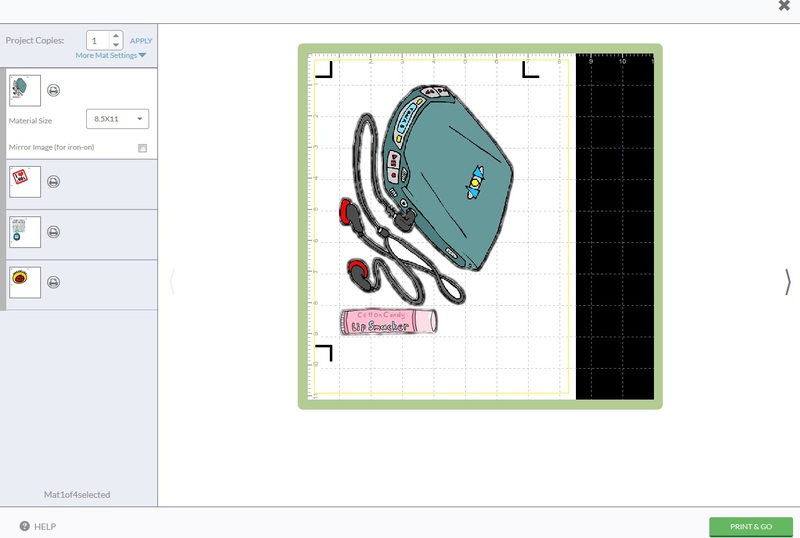 When you first open Cricut Design Space™, you will notice you can either click on the big blue “Create New Project” button to start from scratch or you can choose one of the “Make It Now” projects. These Make It Now projects already have everything laid out for you so all you have to do is send it right to your Cricut, but you may also edit them if you like. For this post we are going to focus on the Create New Project Button. 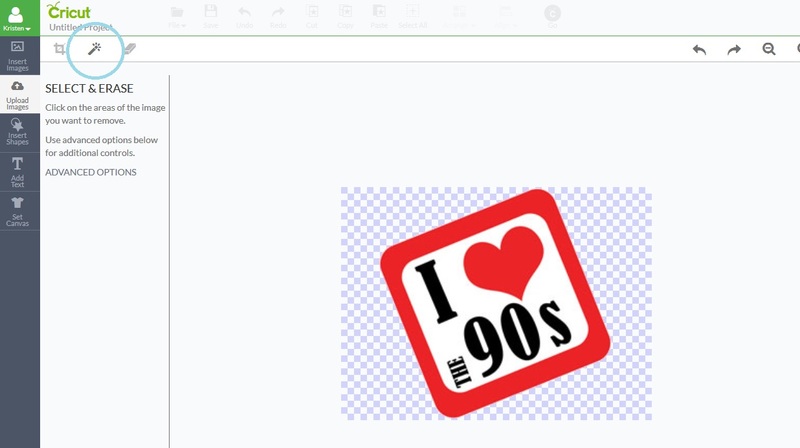 Insert Images After clicking Create New Project, a blank canvas appears with some new tools bars. On the left side are buttons to add images to your project, and the right side are tabs to edit your project. 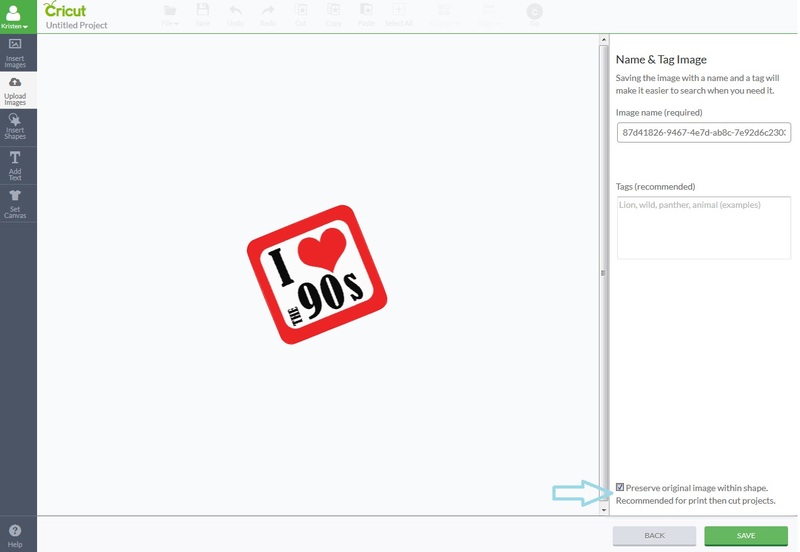 To add an image from the Cricut library, click “Insert Images”. Find the image you would like to insert into your project and click insert. The image now appears in the main window and it can be edited with the tabs on the right hand side. Upload Images If you would like to use an image that is not in the Cricut library, (maybe some clip art that you found on Google) click the Upload Images button on the left side of the screen right below the Insert Images. This will open up a new menu. From here you can choose either a Basic Upload (for .jpg, .gif, .png etc. files) or a Vector Upload (for .svg files). Click on “Upload Image” or “Upload Vector” and the wizard will walk you through all the steps and your image will appear in your design space! Simple as that. This was a very quick introduction that just barely scratched the surface of what Cricut Design Space can do for you! If you have any questions or want to hear more about a specific aspect of Design Space please leave a comments below! I love hearing from you guys! 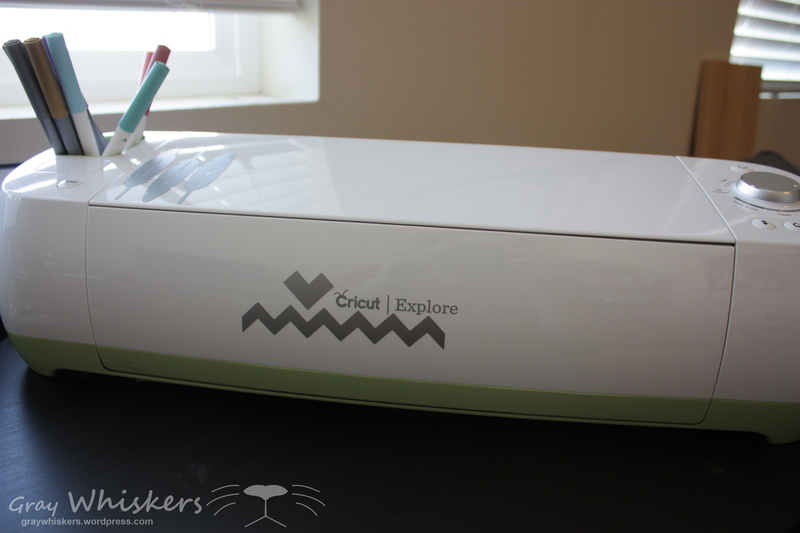 As part of the 4 part series last week I did a post introducing you to the new Cricut Explore Family. If you Missed out on it, check it out here. This week we will do a slightly more in depth look at the Cricut Explore Air™ vs. Cricut Explore One™. To begin let’s look at the Cricut Explore One. This is Cricut’s newest machine, it came out just a few weeks ago. The benefit of this machine is that it gives crafters the cutting precision and the ease of the smart set dial but at a lower price point. Cut Smart Technology The all new Cut Smart Technology Cricut introduced with the Explore machines has really changed the way Cricuts have cut! The Cricut Explore One can cut a large variety of materials (more on this in a later post) with amazing precision from sizes as small as .25″ all the way up to 11.5″ x 23.5″. Smart Set Dial With the smart set dial, cutting a different material is as easy as turning the knob. There are presets for Paper, Vinyl, Iron-On, Light Cardstock, Cardstock, Fabric, and Poster Board. Each of these presets have three ranges: light, medium, and heavy. Once a material is selected with the dial, the Cricut Explore One will automatically set the optimum cutting speed, and blade pressure for the selected material. The other machine in the Cricut Explore family is the Cricut Explore Air. 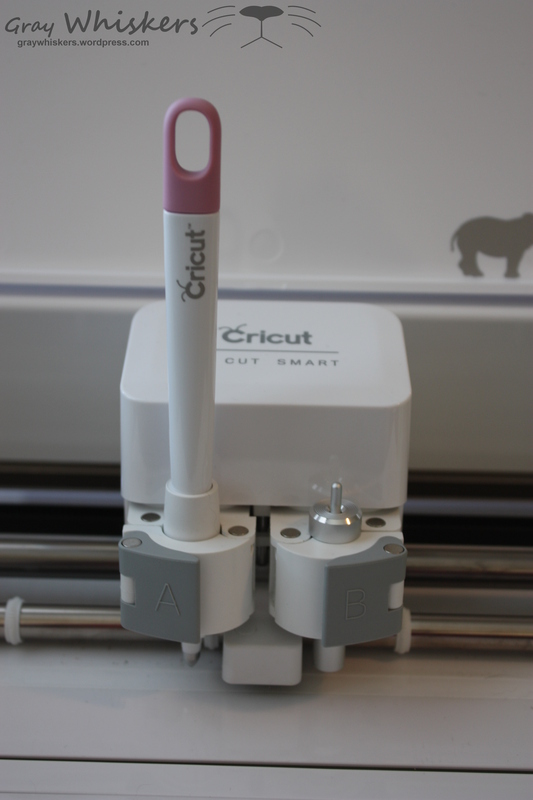 The Cricut Explore Air can do everything the Cricut Explore One can do, but it has an added chamber on the cutting carousel to accommodate a pen or scoring stylus. This allows you to write and/or score and cut all in one step! So you can make your score line, write out your sentiment, then cut out your card base all in one step. It just takes a quick change from the stylus to the pen! 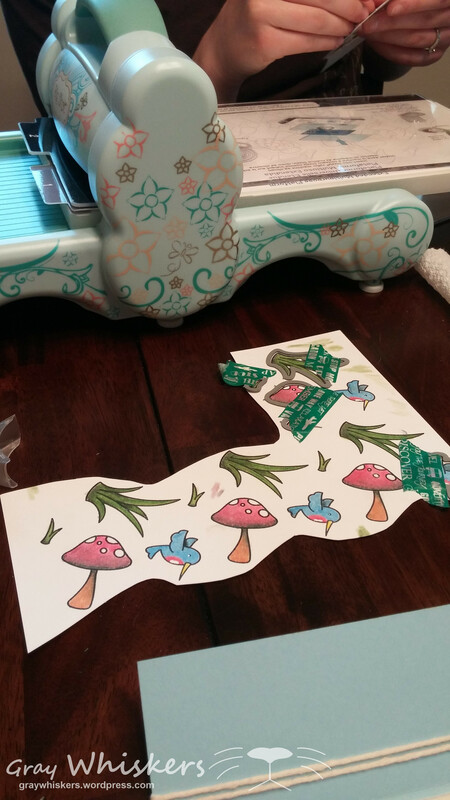 So if you are just looking for an easy to use cutting machine with great precision I would recommend the Cricut Explore One. If you are looking for your machine to do a little more for you, or you want the wireless capability the Cricut Explore Air is best for you. 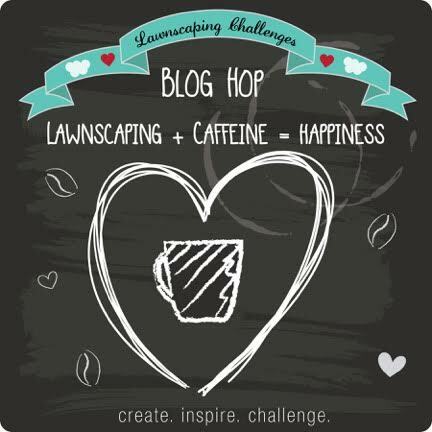 Welcome to my stop on the Lawnscaping Challenge Blog Hop! This blog hop is dedicated to a very dear friend of mine…coffee. So pour yourself a cup, sit back, relax and happy hopping! You probably found your way here from the Stampn’HI blog. Also remember to check out the Lawnscaping Challenges website. The Lawnscaping Challenges website is packed with information on our generous sponsors along with how to win some great prizes. SPEAKING OF PRIZES… Winning prizes on this hop is super easy, all you have to do is leave some great feedback and comments on the blogs featured in this hop. Since you wanted to do that anyway, why not get rewarded for it? Just leave a unique comment (don’t copy and paste the same comment on each blog) down below for your chance to win. You have until the end of the day on June 28th (11:59PM EST) to get your comments in. Winners will be announced on the Lawnscaping Challenges blog. For my project I did a going away card for a coworker who got promoted. 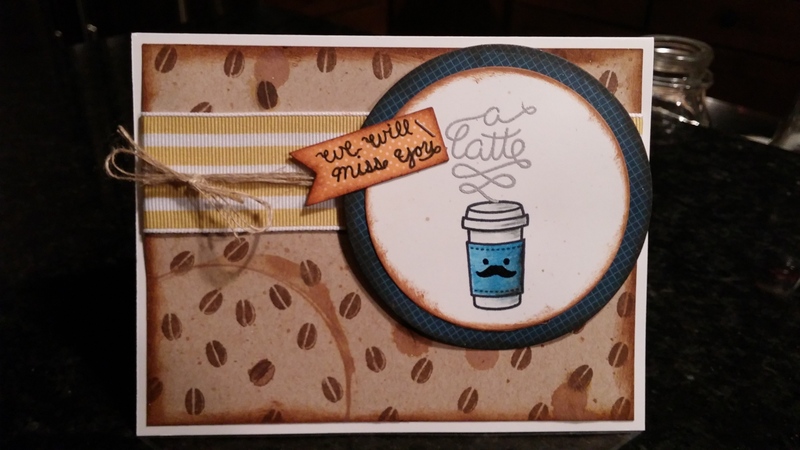 I made a custom sentiment “We will miss you a latte” by selectively inking one of the sentiments in the “Love You a Latte” stamp sets. 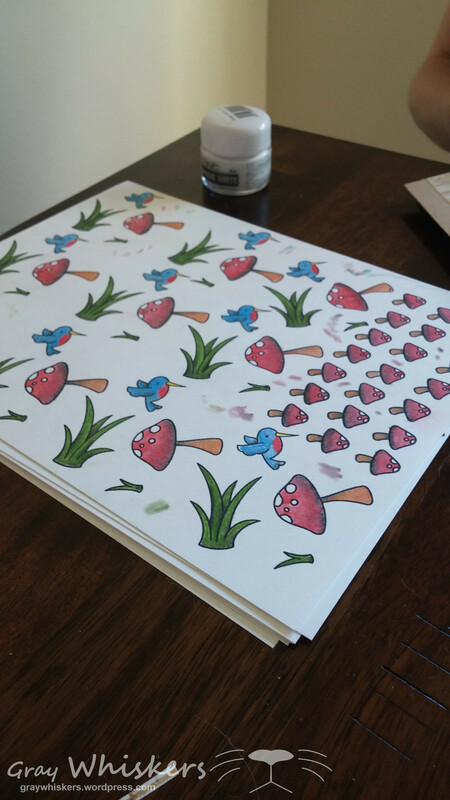 I decorated the background by repeatedly stamping the cute little bean from the stamp set in different directions. I distressed the background so it looked like it had coffee spilled on it and a coffee ring. 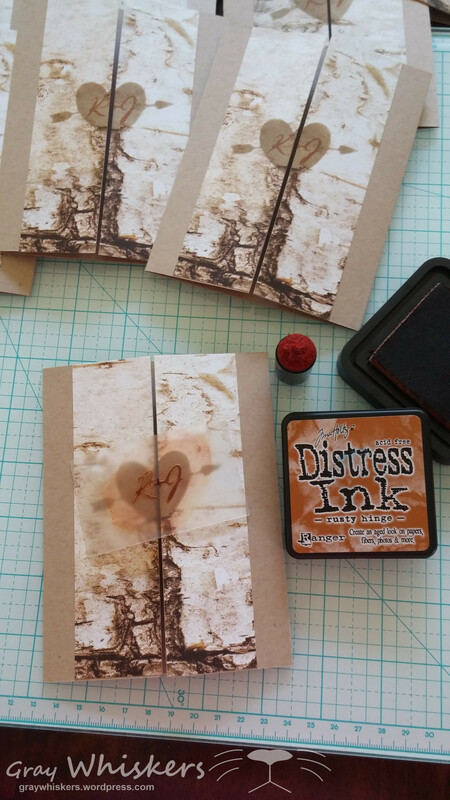 I made the coffee by putting some wet distress ink on a circle die and pressing it on the paper. Thank you to our amazing sponsors for not only inspiring our crafting but also supporting this blog hop. Remember to check them all out: there’s Lawn Fawn, Ellen Hutson, The Ink Road, Crafters Companion, Spectrum Noir, The Alley Way Stamps, Newtons Nook, Faber Castell, and Right at Home! If you encounter any errors along the hop, please email Laurel directly at laurelbeard at me dot com. Please do not leave them in the comments. Thank you so much for stopping by and enjoy the rest of the hop! Next up is Mel’s Card Corner.